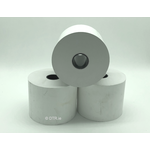 80-GSM Thermal Ticketing Paper Rolls. Heavy weight paper 80gsm. Used for many uses such as Credit Union Receipt Slips, Theatre Entry Tickets, Betting Shop Slips, Cinema Tickets, Racecourse Bookmakers Tickets, Museum Entry Tickets, excetera.